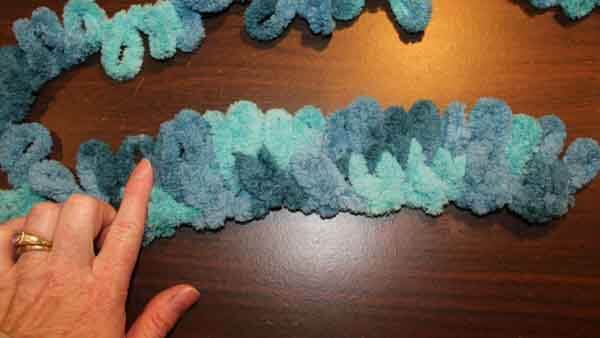 This is the another tutorial in our series of how to knit with loopy yarn. 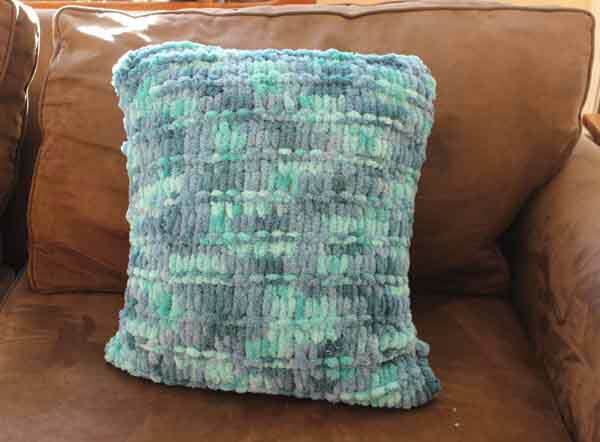 Please watch this video and read on to learn how to knit the criss cross stitch. 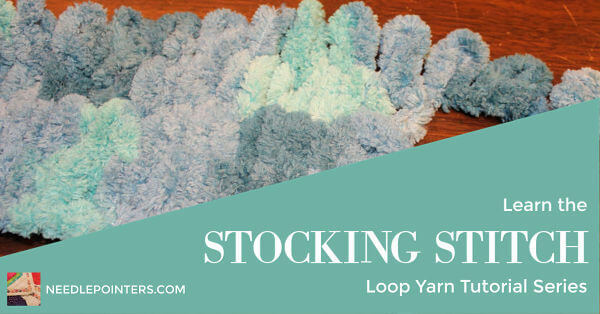 At the end of this article, you will find other tutorials on how to knit with loop yarn. 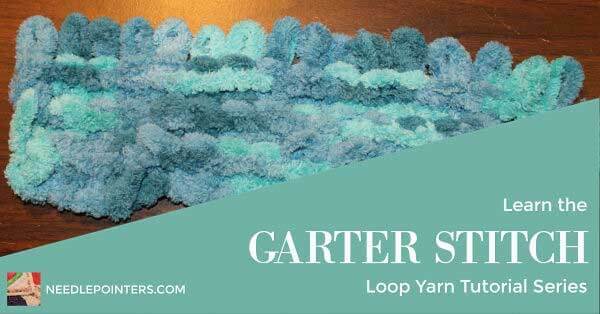 Watch our Video Below or Click the link to watch Loop Yarn Criss Cross Stitch Tutorial in Youtube. When knitting with loop yarn you will start with a foundation row. To make the foundation row, on a flat surface count out the number of desired loops according to the pattern. 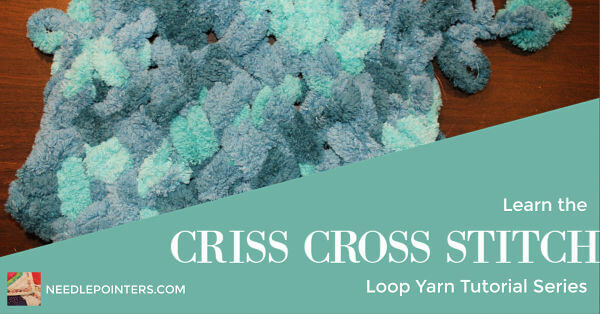 For the Criss Cross stitch you will want to have an even number of loops. 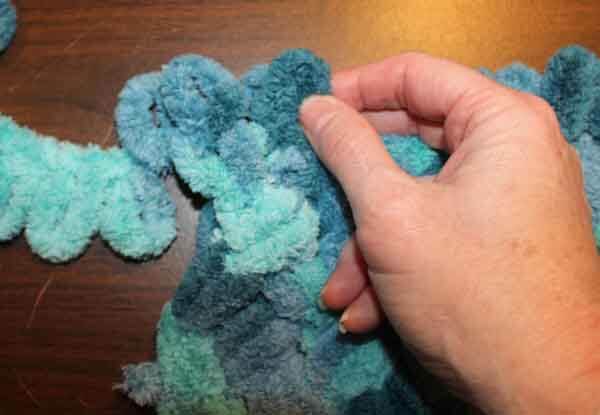 The rest of the yarn is called the working yarn. 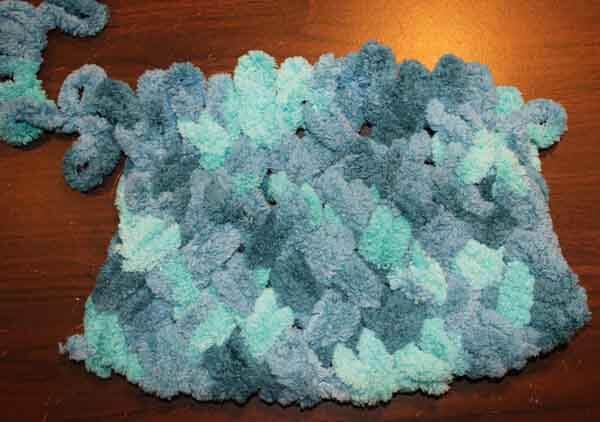 Row 1:For this stitch you will always be crossing one loop in FRONT of the next loop. To start the first row, take the last loop in your foundation row and cross it over the 2nd to last loop in the foundation row. Note: We are not using the working yarn yet. 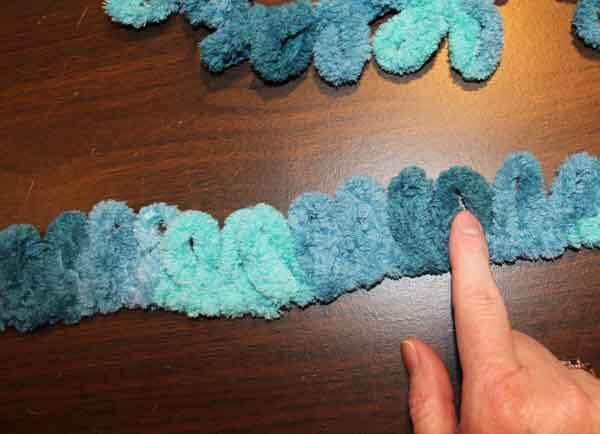 Take the first loop in your working yarn and insert it from back to front through the rightmost loop. This would be the 2nd to last loop from your foundation row. 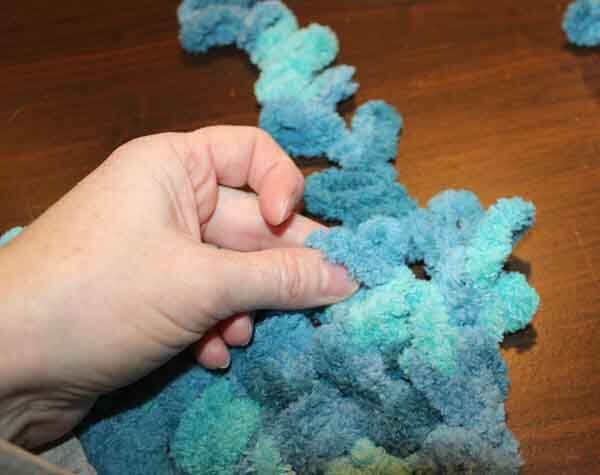 Take the next loop in your working yarn and insert it into the loop you crossed over in the first step. 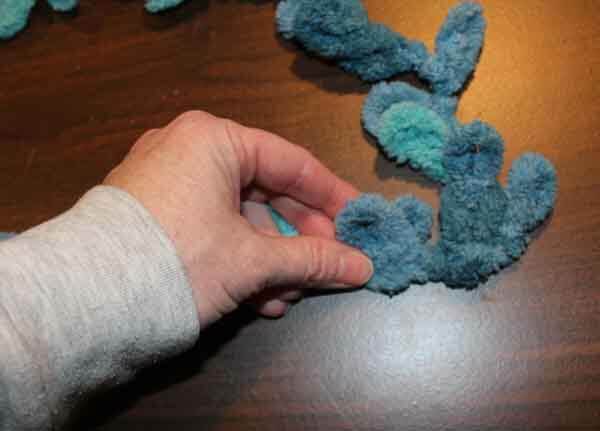 Now you should have the first two loops you crossed over stitched with the working yarn. You are finished with these loops for now. Continue by crossing the next two loops from the foundation chain. Cross the rightmost loop over the one to the left. 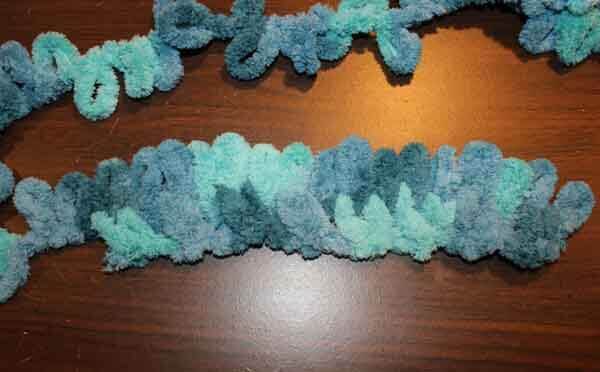 Again take the next loop in the working yarn and insert it through the loop that is on the right from back to front. 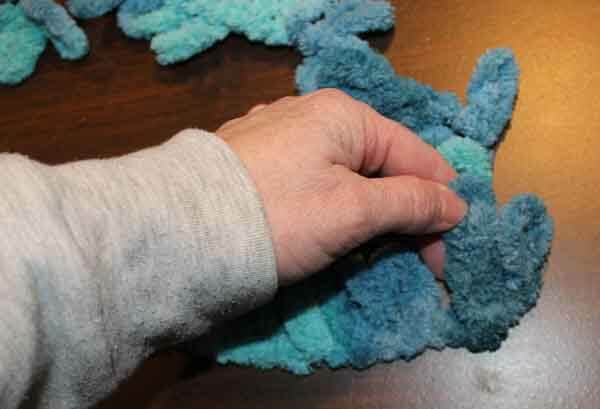 Continue by inserting the next loop in the working yarn through the loop on the left. Continue across the row in the same manner. 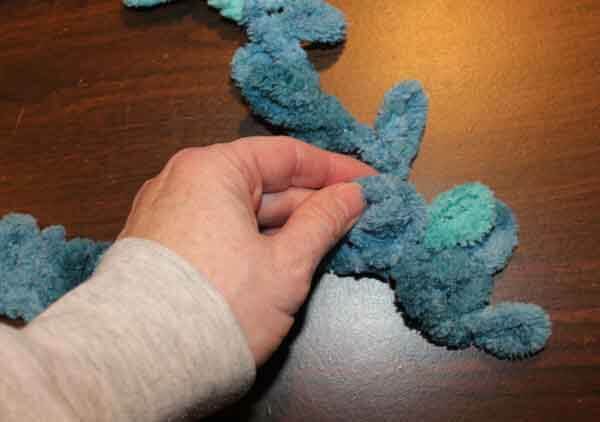 Cross the next two loops with the rightmost one over the left and then inserting the working yarn first in the loop to the right and then the one in the left. At the end of the row, do not turn your work. 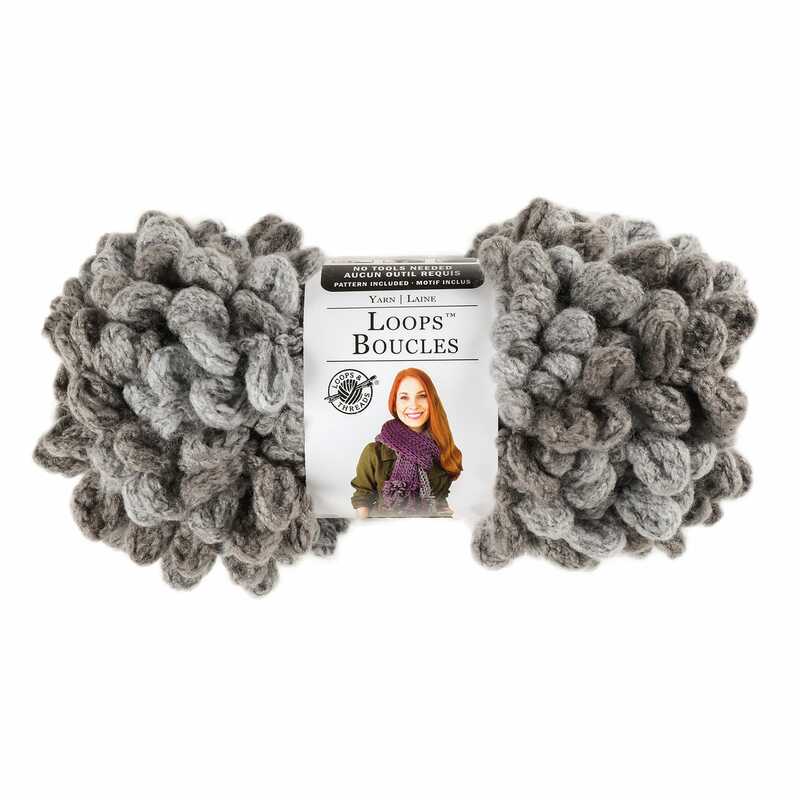 Loop yarn is always worked with the right side of the project facing you. Row 2: When you finish the row, you will continue to the next row. Skip the first loop in the previous row and leave this one unworked. We will pick that one up when we come back after the next row. 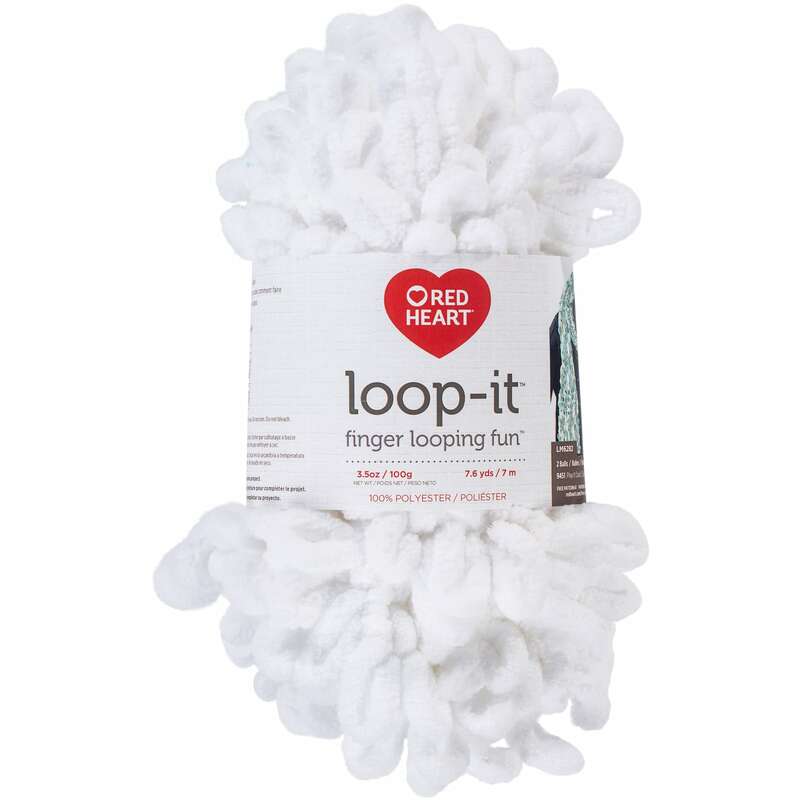 In the photo below, I am pointing to the loop to skip. For this 2nd row, you will be taking the leftmost loop and crossing it over the loop to it's right. Starting with the 2nd loop in the row, remember we are skipping the first one, cross that loop over the 3rd loop from the row. Always cross the loop in FRONT of the other loop. 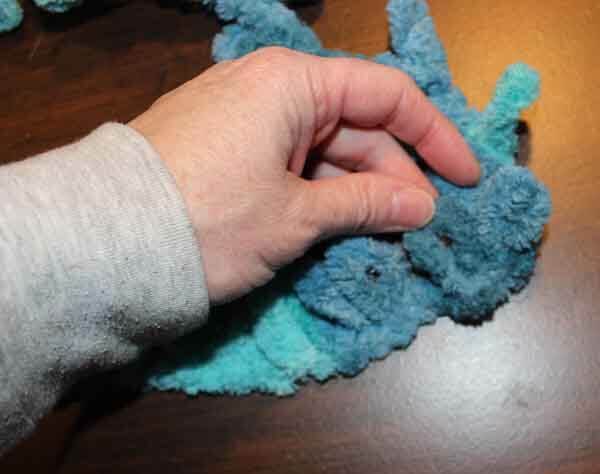 Insert the working yarn into the loop on the left of the crossed loops. Then insert it into the loop on the right. 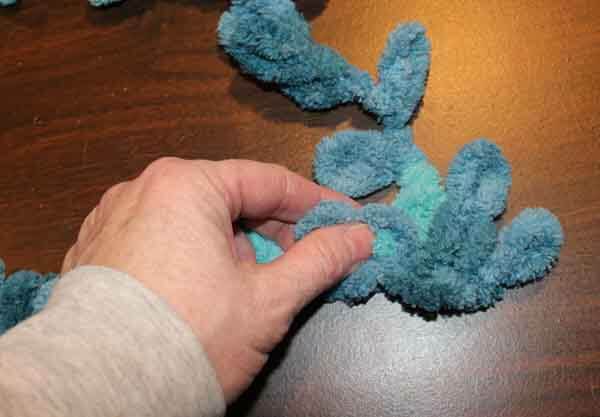 Always insert the working yarn from back to front. 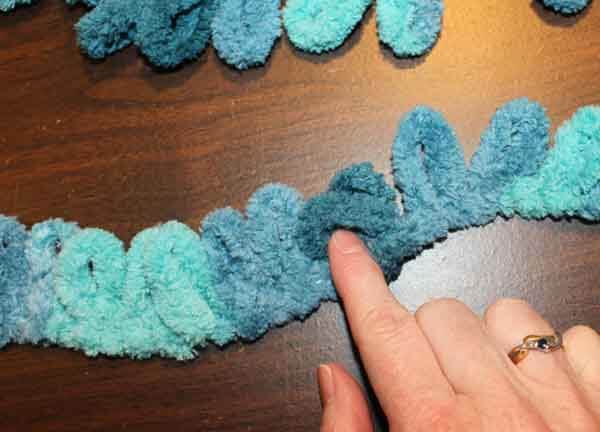 Continue across the row by crossing the leftmost loop over the loop to the right and inserting the working yarn from left to right. 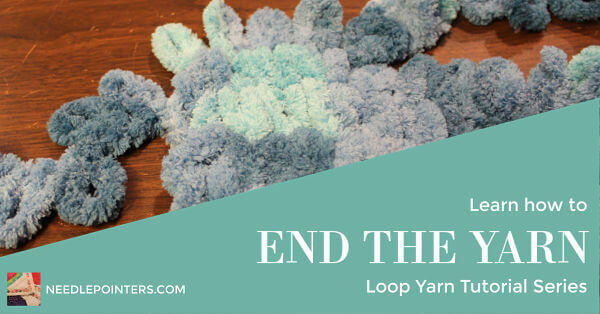 When you get to the end of the row, skip the last loop leaving it unworked. Row 3: Continue with the next row by taking the unworked yarn and crossing it over the last loop from the previous row. I am pointing to the unworked loop to the last row. 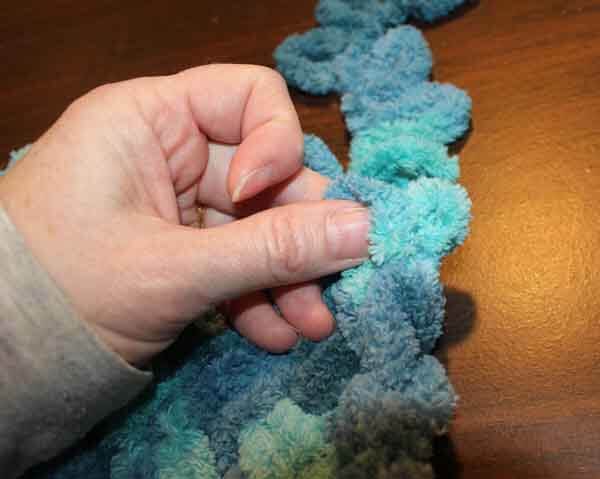 Cross the two loops and then insert the working yarn from back to front through the loop on the right and then the one on the left. Continue back across the row as you did for the previous row. At the end of the row, you will work in the first loop that you skipped in the beginning of row 2. Repeat row 2 & 3 until your project is the completed size. That's all there is to working the criss cross stitch. 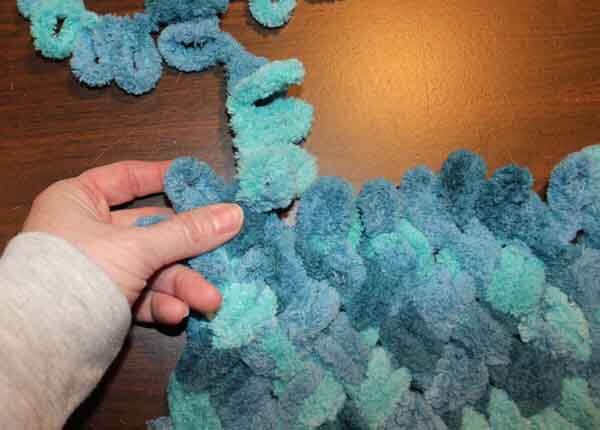 Knitting with loop yarn is fun and easy. Even kids can do it! 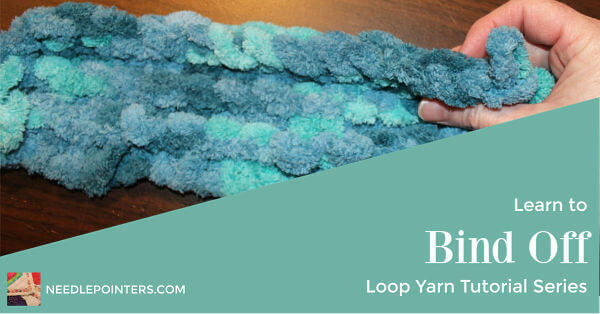 You can find other Loop Yarn Project ideas and tutorials on our Pinterest Board Loop Yarn - Tutorials and Projects.